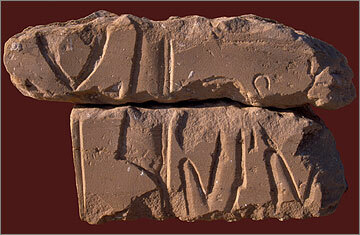 This local name is given to an enclosure south of the main city and to the east of the modern village of el-Hagg Qandil, originally built by Akhenaten probably as a sun temple. 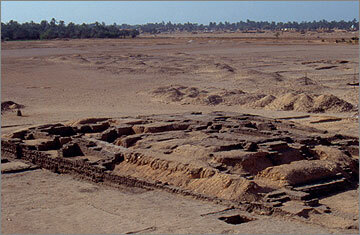 Between 1988 and 2000 the Egypt Exploration Society excavated key areas as part of an attempt (so far successful) to prevent the site falling under cultivation. 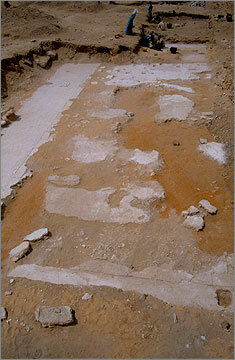 Most of the excavations have been filled in. 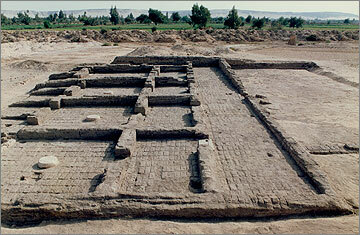 A single large brick enclosure (228 x 213 metres), its walls reinforced with thick external buttresses, had been divided into two unequal parts by an east–west dividing wall and had been entered by pylon-flanked gateways probably on all four sides. 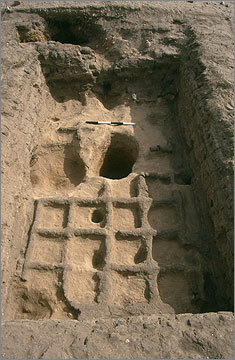 The northern portion had contained a set of parallel brick chambers provided with ovens. 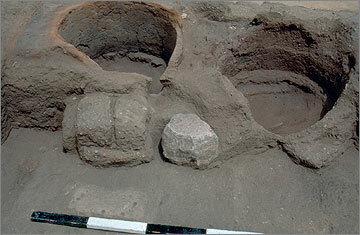 Excavated evidence (including pottery bread moulds) suggests a combined brewery and bakery. Beside it a depression in the desert probably marks the presence of a well. 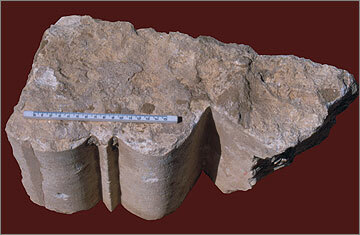 Traces were also found of a gypsum foundation for a stone building (the North Shrine). 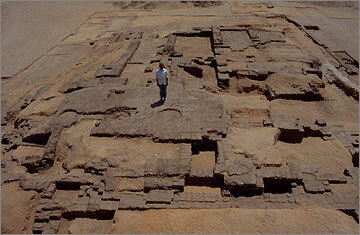 The Amarna Period remains in this part had, however, been overbuilt by an early Christian monastery of the 5th and 6th centuries AD that had, in part, re-used the earlier walls, so disguising or destroying the nature of the original buildings. 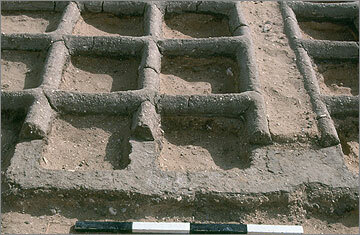 A portion of the monastery, including both the church and domestic/industrial quarters, has been excavated. A major pylon in the enclosure wall, the wide gateway space floored with stone. The South Pavilion, a narrow rectangular building with stepped entrances on south, west and east. A central columned building opened on to sunken gardens on the east and west sides, the gardens laid out for plants set in a cubit-sized grid. The Central Platform, a square podium supporting a series of rooms, some of them columned, the largest being a wide columned hall provided with a stepped dais on all three sides. The possibility should entertained that one or all of them communicated to the outside by means of Windows of Appearance. 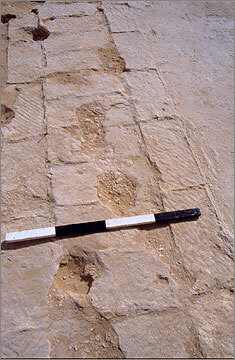 The platform had been reached by ramps on the north and south, and perhaps by another pair attached to the ends of the east side. View to the north-west of the Central Platform at the end of excavation. 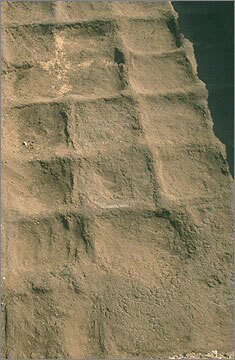 The South Shrine, its position and outline plan given by a gypsum foundation platform on which remained many marks from the lowest course of blocks. It seems to have consisted of a series of chambers on the east and a portico of columns on the west. 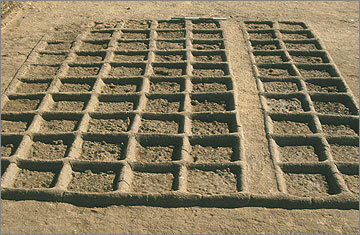 Also in the southern portion was a group of houses in the south-east corner, arranged in two sets facing each other across a court; a set of cubit-sized garden plots was laid out at ground level in the north-east corner. The whole complex has a broad resemblance to Maru-Aten. 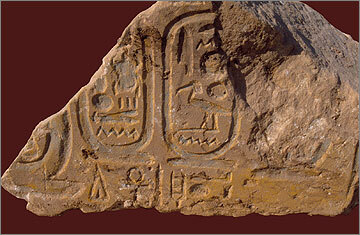 Careful study of the relief fragments recovered during excavation has demonstrated that at least part of it bore the name ‘Sunshade of Ra’ (i.e. Sun Temple) and that it had belonged to Queen Nefertiti (Williamson 2008; Williamson 2016). Kemp, B.J., ed., 1995. 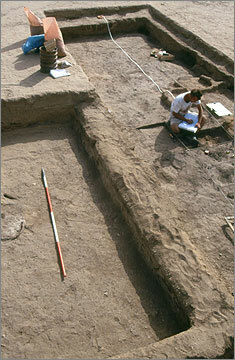 Amarna Reports VI. London, Egypt Exploration Society, 433–8, 453. 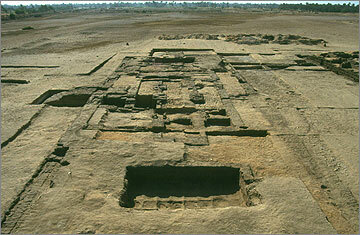 The expedition began a rescue excavation at Kom el-Nana in the spring of 1988 which was continued for several more years. For the 1989 and 1990 seasons the McDonald Institute for Archaeological Research of the University of Cambridge offered fieldwork grants for the project and they were used to cover the costs of the excavation of certain parts of the site where the buildings seemed to have been constructed as places for ceremonies for the royal occupant(s) — the site as a whole seems to have been set aside for Queen Nefertiti — and for the cult of the sun. To these parts we gave the names Central Platform, North Shrine, South Shrine, South House (later changed to South Pavilion) and South Pylon. Smith, W., 2003. 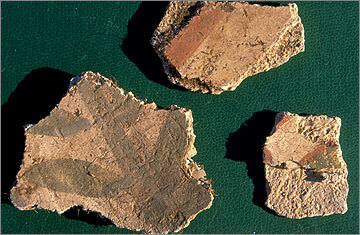 Archaeobotanical investigations of agriculture at Late Antique Kom el-Nana (Tell el-Amarna). Seventieth Excavation Memoir. London: Egypt Exploration Society. Williamson, J., 2008. 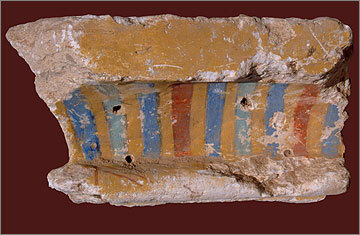 The Sunshade of Nefertiti. 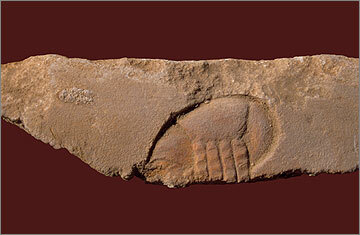 Egyptian Archaeology 33, 5–7. Williamson, J., 2016. 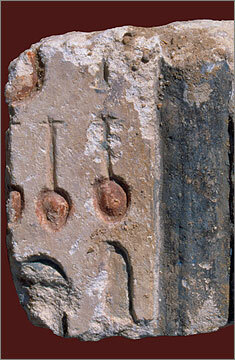 Nefertiti’s Sun Temple; A New Cult Complex at Tell el-Amarna. 2 vols. Leiden, etc. : Brill.